If it feels like you're always looking for free baby quilt patterns for your next shower gift, this eBook is for you! 14 Easy Baby Quilt Patterns for Boys and Girls is chock full of new ideas for baby quilts. Make these baby quilts as gifts for expectant mothers, presents for baby birthdays, or as cuddly blankets for your own little ones. Don't get stuck in a rut making boring checkerboard quilts from charm packs. Get creative with some of the fun free quilt patterns in this eBook. They are cute and creative, but that doesn't mean they're difficult to make! All of these quilts are suitable for inexperienced quilters. 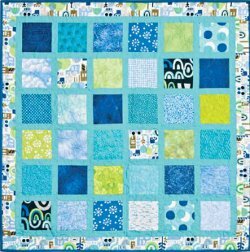 All you need is some basic quilting skills and a zest for trying new things to make the simple quilts in this collection. No matter who you are quilting for, you're sure to find the perfect quilt in the 14 Easy Baby Quilt Patterns for Boys and Girls eBook. 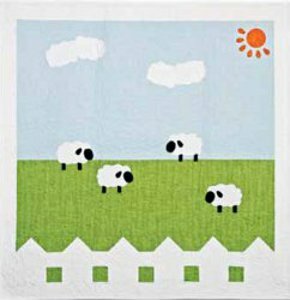 We have pulled together both patchwork and applique baby quilt patterns, both baby girl and baby boy quilt patterns, and patterns for both animal quilts and floral quilts. You'll find patterns to use with your AccuQuilt GO! dies and patterns that you can make with just a few scraps from your fabric stash. Download the free eBook today for access to all of these easy but adorable baby quilt ideas! Get your free copy of 14 Easy Baby Quilt Patterns for Boys and Girls today! While you're here, consider these other titles from FaveQuilts! Babies adore animals, and quilts with little critters help kids to learn about the natural world. Make a few of these animal quilts and soon you'll have an entire menagerie of quilty creatures! The patterns in this section of 14 Easy Baby Quilt Patterns include both applique baby quilt patterns and patchwork quilt patterns, so you can choose to applique animal shapes to your quilt top with solid fabrics or use fun animal prints that you find in the fabric store for patchwork patterns. The best way to customize a baby quilt design as a gift is to include the baby's name, and 14 Easy Baby Quilt Patterns for Boys and Girls offers plenty of options. In the "AlphaBaby Quilt" (pg. 15) the baby's appliqued name even serves as the primary design element. These personalized baby quilts are perfect for making special gifts that will be cherished as the child grows older. Download 14 Easy Baby Quilt Patterns for Boys and Girls for free! If you find piecework too finicky but adore applique, the applique baby quilt patterns in 14 Easy Baby Quilt Patterns for Boys and Girls are for you. With a little fusible webbing and some applique templates or maybe a die cutting machine, you can have a baby quilt done in just a couple of hours. Several of the quilts patterns like the "Squares and More Baby Quilt" (pg. 11) and the "Diagonal Baby Quilt" (pg. 13) are designed for using AccuQuilt GO! dies, which makes them especially convenient. We know it can be difficult to find a good variety of baby quilt patterns for boys, so we have included plenty of baby quilts in traditionally masculine colors. 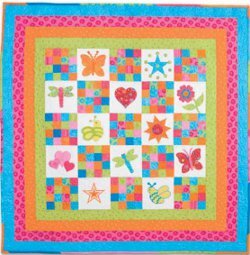 Although many of these simple quilt patterns like the "Framed Charm Squares Baby Quilt" (pg. 28) can easily be adapted for baby girls if you make them with more feminine fabrics, the color combinations and patterns in 14 Easy Baby Quilt Patterns for Boys and Girls will provide you with plenty of inspiration for baby boy quilts. 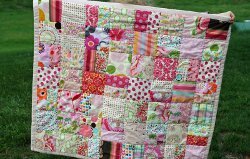 We all love making quilts for baby girls. The pretty fabrics are just irresistible! 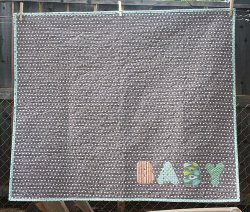 Luckily the baby quilt patterns for girls in 14 Easy Baby Quilt Patterns for Boys and Girls are all about showing off the fabric. Beyond showcasing your fabric goodies, these easy quilt patterns are a good way to learn about new techniques. They are all guaranteed to be easy patterns, and because they're baby quilts, they are small-scale projects that allow for some experimentation. Try out rag quilting with the impossibly simple "Beautiful Baby Rag Quilt" (pg. 33), or gain some experience with foundation paper piecing while making the scrappy squares in the "String Block Baby Quilt" (pg. 29). Download 14 Easy Baby Quilt Patterns for Boys and Girls for free today! Next time you've got a baby shower or a toddler's birthday coming up, don't stress out trying to figure out what kind of baby product to buy. Make a gift that comes from the heart! A handmade baby quilt is an enduring source of comfort and warmth. It's a gift that shows you truly care, and it's sure to be appreciated by the baby's family for years to come. Make your gift extra special by using one of the creative baby quilt patterns in this collection. They're easy enough for a beginning quilter, but still adorable.These baby quilts are wonderful for your own children too. Whether you just need something to keep your little ones warm at night or you're working redecorating the nursery with handmade items, you'll find an inspired pattern to fit your needs in the 14 Easy Baby Quilt Patterns for Boys and Girls eBook. This eBook is available to FaveQuilts readers at no cost, so you won't have to spend a cent on the pattern for your next baby quilt! Each pattern includes a materials list to make shopping a cinch and step-by-step instructions with full-color photos and diagrams so the pattern is easy to follow. Once you have downloaded the eBook and subscribed to our Piecing It Together newsletter, you will receive new free quilt patterns in your e-mail inbox every week! Join the FaveQuilts.com quilting community and gain access to hundreds of free quilt patterns and connect with quilters all over the country. Download this free eBook and check out FaveQuilts.com for tons of quilting inspiration! Love these patterns! I am going to improvise. Rather than using the patterns for 'AlphaBaby Quilt' and 'Diagonal Baby Quilt', I plan to use the one for 'Streak of Sunshine Baby Quilt' and applique the name of my great grand baby-to-be in the center diagonal row. Can't wait to start!! Thanks for the idea. This should be renamed, Buy a go cutter so you can make these quilts. Not everyone can afford a cutter. Deleted from my download. Hi earldon 9807780. Have you tried saving the download to your computer? If you follow one of the green links on the page you will be able to save the PDF version to your desktop. I would love to see a pattern for easy sailboat blanket for baby. The tumbling block is easier than I thought.